New for 2019 we’ve added an additional 12 legs for a total of 24. While we don’t yet have the fancy maps and details for the new transition areas, we’re happy to provide the maps from last year regarding the original 12 legs, as well as our rough draft of the new transitions in the table below. The new transition areas will cut each of the 12 legs roughly in half. DO NOT underestimate this leg! The elevation map doesn’t look too menacing, but in reality it is a punishing 54 miles usually made worse by a head wind that nags at your motivation. This leg does have a lot of climbing, but it is also among the most scenic. It is a great way to start off a great race. Watch for the Hole-in-the-rock at mileage 15.9 and Wilson arch at mileage 25.8. Parking: Park around city park perimeter. Watch for bicycle traffic. Park has water, bathrooms, and plenty of grass and shade. If you brought you skateboard (or razor scooter) there is a nice skate park area to practice your moves. This leg will take you past the beautiful Abajo (Blue) mountains on the right. Passing thought the Comb Ridge at mile 37.5 is a majestic moment. Leg ends at the Mule Canyon trailhead where Anasazi ruins dating back to 1200 AD can be explored. GASOLINE WARNING!!! After the turn off at State Road 95, the next gasoline is in Hanksville, 121 miles away. Make sure to fill up in Monticello, Blanding, or the gas station at the corner of 191 and 95. Parking: RV’s must park along the side of the Hwy just before Mule Canyon. The parking area is small and the BLM does not permit us to park RV’s inside the loop. Other support vehicles may park in the Mule Canyon trailhead parking lot if space allows. Watch for cyclists. There is a bathroom at the trailhead. Take a moment to do a short hike at Mule Canyon to see some of the ruins dating back to 1200 A.D. This leg is long but offers a nice gradual downhill leading to the Colorado River and beginning of Lake Powell. Pass the Natural Bridges National Monument at mileage 17.6 where the team vehicle may want to stop for a moment and view some of bridges at the National Monument. Also notice the Jacob’s Chair landmark around mileage 35 on top of the cliffs to the right. As you come to Lake Powell you will cross the Colorado River bridge then immediately after that the Dirty Devil Bridge. Enjoy the beautiful scenery of Lake Powell. Parking: Park in gravel area on right at exchange. Exchange is just after Dirty Devil Bridge. No amenities. However, there are several bathrooms as part of a camping area less than a mile after the exchange on the left. Sponsor: Advanced Therapeutic Massage, INC. This leg has a gradual climb out of Lake Powell up to a plateau summit followed by a gradual descent into Hanksville. Enjoy the view of winding red rock canyons all along the ascent and tall rock pillars and layered cliffs along the descent. Parking: Park in gravel area at right near just before Hollow Mountain gas station in Hanksville. Exchange is just before Hollow Mountain gas station in Hanksville. Food, water, and restrooms at gas station. Be sure to thanks Hollow Mountain staff for use of their location. This leg is a significant climb that follows the Fremont River (upstream) most the way. At mileage 29.0 you will enter Capitol Reef National Park. This is park is one of the last great secrets in the USA. As the sun sets in front of you the light will illuminate the towering red cliffs. The historical town of Fruita at mileage 37.4 shows how early settlers of Utah lived. The green fruit trees of Fruita contrast beautifully against the red cliffs overhead. Parking: Ample parking at Sinclair gas station on right. Food, water, and restrooms at Sinclair gas station. Gas station and hotel are owned by super great guy from Armenia. From Torrey start climbing up UT-12 into the Boulder Mountains. Climb is steep up to a false summit at mileage 15 then after a short descent and 5 more miles of climbing you will hit the boulder pass. Take a moment to enjoy the view the east. The mountains seen in the distance are the Henry’s that you just passed earlier in the day. After summit you have a steep descent down to the quaint town of Boulder and to the exchange. Take caution and watch for cattle, deer, and elk on the road during the descent. Parking: Park at Sinclair gas station (drive up short dirt road on right). Food, water, and restrooms at Hills Hollows Sinclair gas station. Watch for cyclists as you pull out of gas station. This section of State Road 12 is what makes it famous! It just cannot be put into words, but here we go with a meager attempt. As you descend from Boulder down to the Escalante river, you will thoroughly enjoy cycling down the famous ridge at mileage 6.3 with steep drop offs on both sides of the road. You will feel as though you are cycling in the clouds. As you near the Escalante River you will pass the Calf Creek Gorge (home of Calf Creek Falls) on the right. Excellent views from a top the road down to the green bottom of the gorge are breathtaking. Shortly after climbing up from the river on the other side you come to a windy section of road that contours a rugged white slickrock. 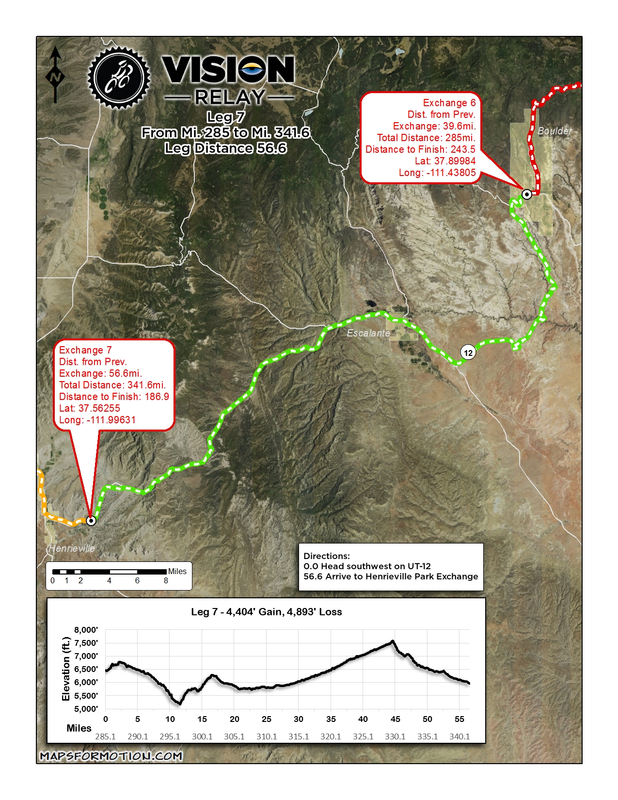 At mileage 26.1 you will pass through the town of Escalante and begin an ascent back into Dixie national forest. After reaching a mild summit, you wind down the narrow canyon and end in the town Henrieville, population 165. Parking: Turn right on 100 W in Henrieville and park on the west side of the park. Small park has water and shade (like you’ll need it in the middle of the night). Restrooms located in Tropic (5 miles ahead) at the pizza restaurant. Shortly after leaving Henrieville you will pass through the small towns of Cannonville and Tropic. In Cannonville at mileage 3.4 you can find a visitors center for the Grand Staircase-Escalante National Monument. After Tropic enjoy the views to the west of Bryce Canyon National Park from below. At mileage 10.9 you will enter the Park. The road winds up the canyon with spectacular red hoodoos all around. Yes, the official name is a hoodoo. Reach the summit at mileage 14.4 and stay on top the plateau for about 9 miles, then begin the descent into Red Canyon. Again more hoodoos in every direction and pass though the 2 red rock tunnels at mileage 24.4 and 24.5. At the bottom of Red Canyon take a right in UT-89 and finish the leg into Panguitch. Parking: Park at gas station. Exchange at Silver Eagle Gas Station. Restrooms available. There are several gas stations and stores in Panguitch where food, water, and restrooms can be found. This leg boasts the steepest ascent with over 3200 feet of climbing over the 37 miles. You will start climbing immediately out of Panguitch, entering the Dixie National Forest as the high desert landscape turns to mountain. Enjoy a short flat area as you bike around the scenic Panguitch Lake at mileage 15.7. After making a left to head to Duck Creek, you’ll have some downhill (and more uphill of course). Parking: Park on large gravel parking area on left of road. This Exchange is the highest elevation on the course at 10,080 feet. There are no amenities available. Be prepared for possible cold (and even snow)! Take a right at UT-14 to begin the steep and beautiful descent to Cedar City and exchange location at the Main Street Park. Parking: Plenty of parking around perimeter of park. Best Western next to nice large park in downtown Cedar City with ample shade and space to spread out and rest. Water and restrooms located at park. Several gas stations and restaurants within walking distance of park. After leaving Cedar City make the 1,000 foot climb to the Iron Mountain Pass where early Utahns settled in 1850 as part of the “iron mission.” After the pass at mile 30.0 arrive to the tiny town of Newcastle and follow the Bench Road through the ranchlands until you arrive at Enterprise. Parking: On right at motel or gas station right after exchange. Food, water, bathrooms located at gas station. What better way to finish the Relay than with a 4,000 foot plus descent into Ivins. Pass through the cedar and juniper-rich mountains south of Enterprise and then descend down through the ancient volcanoes near Veyo and past Gunlock Reservoir. If desired, the 3 team members can meet up with their cyclist to finish the last mile or two of the course together. You have made it and deserve a good rest and time to relax. Unity Park awaits with hydration and goodies! Parking: Around Unity Park. Be courteous to local residents and park in legal locations only! Finish line has all amenities needed. It has water, bathrooms, tons of grass and shade, and plenty of space to relax. Plenty of food and restaurants within short walking distance of park. Relax the legs and enjoy the great accomplishment as you have just conquered the Kokopelli Relay!